What’s wrong with manual integration? 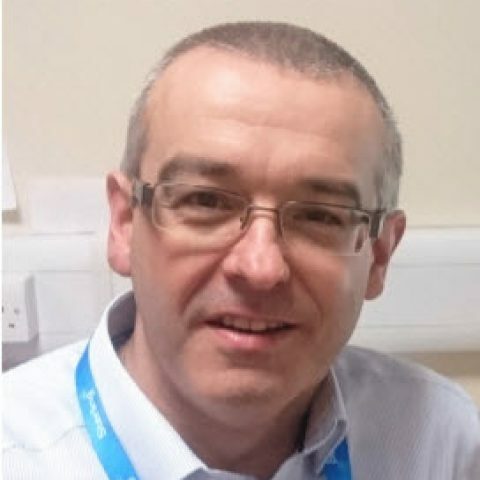 In June 2017, during a Medicines and Healthcare products Regulatory Agency (MHRA) audit I was asked, “Do you use manual integration?” In the conversation that followed the auditor recognised that there was a potential requirement for manual integration, but they also expected to see control of its use. The general opinion has always been that manual integration can be used to “polish” results into specification, however, automatic integration used incorrectly can be inaccurate and also used to “polish” data. 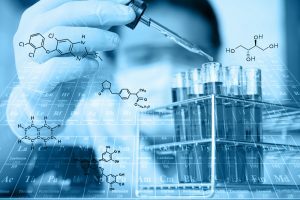 Laboratory controls do not include the establishment of scientifically sound and appropriate specifications, sampling plans and test procedures designed to assure that drug products conforms to appropriate standards of identity, strength, quality and purity. Specifically, integration parameters are not established to ensure peaks are detected. Your Quality Unit failed to conduct an investigation where unknown peaks were observed (but not integrated) due to inhibiting integration. Your QC head agreed that known or unknown impurities will not be identified even if they are present if integration of peaks is inhibited for a particular time frame. Forgetting compliance for a moment, manual integration also has significant efficiency implications: why waste time “drawing” three peaks in 30 injections when the automatic Cobra detection algorithm can do the majority, if not all, of the work for you? Back to the MHRA audit in 2017… Fortunately we had already implemented a plan to improve our performance and reduce the levels of manual integration carried out at Sterling Pharma Solutions. Back in the summer of 2016 I received a request from Darren Barrington-Light of Thermo Fisher Scientific asking if he could test a series of queries and report templates on our data. Slightly embarrassingly, one injection query actually failed due to the very high levels of manual integration being used at the time — a clear sign better control was needed! At that point I asked myself, “Where do you see yourself in two years? 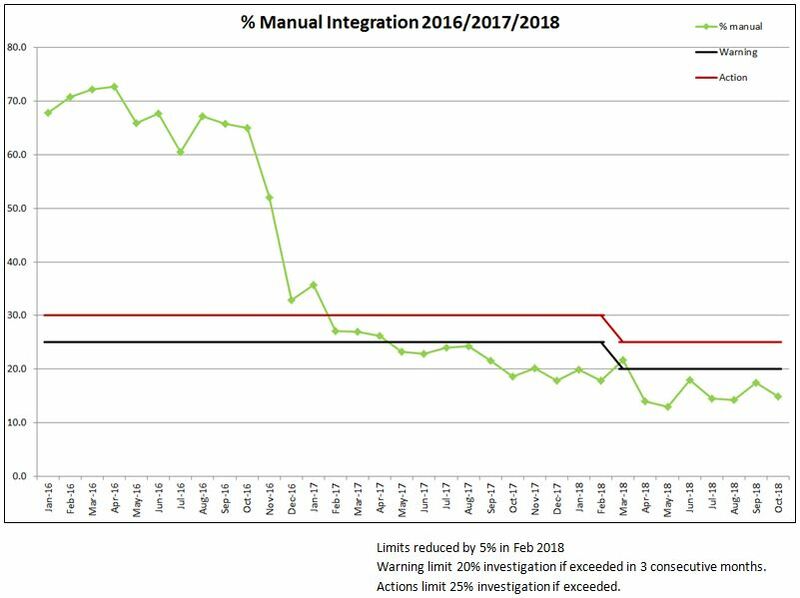 Trying to defend high levels of manual integration to an FDA or MHRA auditor?” So I set a challenge to reduce manual integration to less than 20% by the summer of 2018. Using Chromeleon CDS Injection Queries and associated Report Templates, we initiated a programme of manual integration monitoring. In early 2016, more than 70% of injections had some form of manual integration. We achieved manual integration rates below 25% by the time the MHRA audited us in June 2017 and then reduced further to <15% in October 2018, with our formulated products group routinely operating at 0%. The report template we developed with Thermo Fisher Scientific also shows the manual integration levels per individual analyst. This means we can quickly identify whether training is required or if a particular method is less than optimal and will require the use of manual integration on a routine basis – this can then be detailed in the relevant SOP. I’m sure you will agree that both manual integration (example 1) and automatic parameters (example 2) can produce integration that is not ”accurate” or “adheres to sound scientific principles” and the FDA warning letter previously mentioned shows how the detection parameters can be used to affect the data in a detrimental way. In order to control integration we needed to utilize Chromeleon software’s automatic tools better, control manual interventions and review integration regularly — so we introduced an “Integration and Chromatography Review” SOP to ensure all integration is subject to a robust review of the electronic data (including audit trails and audit trail comments). Our integration SOP incudes examples of acceptable and unacceptable integration and details the basics Chromeleon software’s great automatic peak detection features — the Cobra algorithm, the Cobra Wizard, and the SmartPeaks™ Integration Assistant. We wanted a better understanding of how they worked and how best to apply them to our methods so, with the support of Thermo Scientific and using available resources, such as Product Spotlight Chromeleon CDS: Speed Up Data Analysis and Technical Note 70698, Intelligent Integration Using Cobra and SmartPeaks, we revisited our methods and further training was rolled out to all analytical departments and users. This is coupled with a training programme on how to use detection parameters, how Chromeleon CDS clearly highlights manual integration and concludes with a practical exercise where analysts must identify unacceptable integration in a pre-prepared sequence. This includes some subtle and not so subtle manipulations. Example 1 above is one of the less subtle examples from the training! Are you controlling manual integration? In summary the approach we have taken is a balanced one — the balance is tipped in favour of automatic integration but manual integration is not outlawed. The good news is that Chromeleon CDS provides powerful, intuitive integration and querying/reporting tools and if we strive for better methodology there is no reason why our manual integration levels will not continue to fall. Who knows, maybe we’ll be below 10% by summer 2019? !